Reason I choose it: I'd only just got my kindle so downloaded a lot of free books. I later had to delete many of them as they belonged to a series and the rest of the books were around £9 each. Fifteen women respond to an advert placed by Hamilton Drake saying that they are able to claim homestead in order to better their future. He makes it all the more real by providing paper etc... but his actual motive is to get the ladies to Nebraska and then use them to gain some money from men there looking for wives. The sixteenth lady joins them by mistake when she is running away from her past and is swept into the group on the train. This is a christian related book where each chapter begins with a couple of lines from the bible. This didn't bother me as I was able to just not read it and continue with the story which had only a small reference to the church. It was a book worth reading and seeing how things develop for each lady but the only downside for me is that you never actually get to find out what exactly all the women are running away from... ok so all of them have lost a husband in the war but for some you get hints of under lying problems. I also felt one or two of the characters didn't have enough attention paid to them so you never got to really know them. So overall there were still a general mysteries and unanswered questions. Thanks so much for taking time to give a fair review that includes constructive criticism. I always learn from discerning readers and I'm glad that, overall, you enjoyed the read. Thank you so much for stopping by and taking the time out to leave a comment as I really appreciate it as I've never had the actual author stop by before. I'm glad you appreciate my opinion as I do know that this was your first long story but remember you can't please everyone. You're right about not being able to please everyone ... 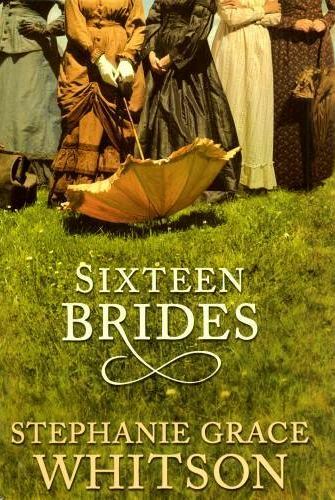 I just wanted you to know that Sixteen Brides was actually novel #20-something for me ... and every books seems to bring a new challenge. For that book, it was all those women's voices seemingly wanted their own point of view! I actually took it as a compliment that you wanted to know more about the characters. So again, thanks! I'm glad I didn't offend, its the nosey person in me I guess that wants to know exactly whats going on with everyone but I know its also difficult when you want to keep the book to a certain length. Even the men would have been interesting in this one too :). Its one of the reasons I like growing up with a character or having epilogues of a couple of years later.